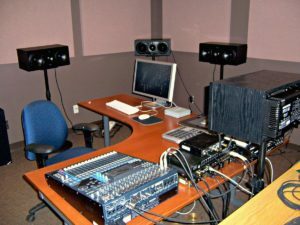 AlbertaEARs (Electroacoustic Research Studios) is a suite of teaching and research facilities serving composition students and graduate student and faculty research. Located in the Fine Arts Building in Studio 2-7D, the Electroacoustic Studio is a state-of-the-art facility for teaching, composition, and performance of electroacoustic music. It is our main teaching space for a range of courses in electroacoustic music and technology, and may be reserved for use by students who are enrolled those courses. The studio contains historically significant equipment as well as the latest technologies. Some of this equipment includes vintage analog synthesizers from the early 1970s, several formats of reel-to-reel analog tape machines, including a 1/2″ 8 track recording system with dbx noise reduction, several MIDI synthesizers from the last three decades, MIDI and USB controllers of various kinds, a computer with music production software (Logic, Ableton, Reaper, Max/MSP, ChucK, Native Instruments software synths, and more), and an upright Disklavier (computer-controlled piano). In addition, this studio contains significant space for setting up ad hoc systems and is capable of supporting small group rehearsal scenarios. A CFI/SSHRC funded research facility, this studio is equipped with a small ambisonic system for creating multichannel electroacoustic compositions, and is also being used to create interactive installations and audio games. Equipment is also available for larger-scale performance and installation work in other venues without disabling the room. A computer with Unity, Spat, Max/MSP, Reaper, and other software packages is available for specific faculty-lead research projects. This CFI/SSHRC funded facility is designed for research in the design and creation of custom software, hardware sensor interfaces, and sound-making devices. It is the centre of our research program in interactivity, human-computer interfacing (HCI), circuit-bending, sound installation, and other forms of software and hardware design. It includes tools for prototyping and constructing such devices, including soldering and wiring facilities, and also contains specialized printing equipment for oversized scores, etchings for circuit boards, and other custom projects.